ENGLAND star Harry Winks has invested in a new development on the Costa del Sol. The Spurs midfielder is a shareholder at the Heights, at La Resina Golf Club, in Marbella. The 11 opulent new villas, developed by the La Sala group, include infinity pools, wine cellars and 24 hour security. They also have direct access to the celebrated golf course. “Each villa has specially designed entertainment areas to enjoy the uninterrupted views of the Mediterranean,” said a spokesman for The Heights. 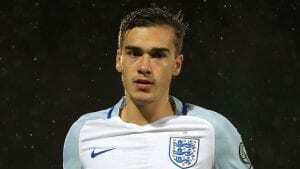 Winks recently made his debut for England in a 2018 FIFA World Cup Qualifier against Lithuania and has made eight starts for Spurs so far this season. He joins a long list of other footballers, who have invested via the La Sala group including David Bentley, Stephen Carr and Shay Given. Golfer Michael Campbell is one of the ‘ambassadors’ for the Heights development, where prices start at 1.275 million euros. Previous articleTickets on sale for Caminito del Rey from next week, but you’ll have to be fast!